The class of 2018 is indeed lucky. It is grandfathered in under Haverford’s old, need-blind policy. Need-blind means that a prospective applicant’s financial means don’t have a bearing on admissions decisions. Haverford is now need-aware. As of 2015, the Huffington Post listed 41 need-blind colleges. In that same year, Haverford’s bond rating was downgraded by Moody’s, due in part, the high cost of such an admissions policy. 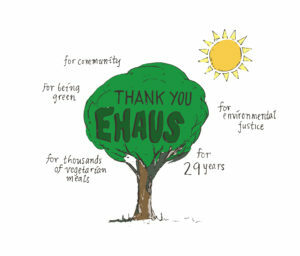 Haverford famously lost a large chunk of its endowment in 2008 and has been looking for ways to keep its finances sustainable. This is not the first change. In 2014, Haverford replaced its no-loan policy, adding in loans for some income brackets starting with the class of 2019. Jess Lord, Dean of Admissions, denied a connection with the endowment, claiming instead that, “The financial aid budget has doubled over the past ten years, and the trajectory for all of higher education suggests that this pattern will only continue,” as reported by Swarthmore’s Phoenix. Now, not only is Haverford continuing the 2014 modified loans policy, (instead of all grants, under the no-loan policy), it is also joining the trend of colleges leaving need-blind for need-something-else. There are arguably many benefits that come from a need-blind policy, and Haverford’s changes have been widely discussed. This is a topic on campus, among concerned students invested in their community. The Clerk has written features, news articles and commentary about the decision, emphasizing the community’s need for an admissions policy that keeps Haverford accessible to all possible applicants. Admissions will still work the same way. The Admissions Office will pick a class based on application and individual merit, without consideration of financial need until the end. Exactly how need-aware considerations will influence final admissions offers is not clear. But how does Haverford stack up against our peer institutions who are looking to attract the same students? According to College Scorecard, a website run by the US Department of Education, the school measures up pretty well. Haverford is cheaper (on average) than both Swarthmore and Bryn Mawr. A lower percentage of students take out loans, and they graduate with less debt. To get an idea of how Haverford compares to “similar” school in terms of tuition and affordability, it helps to compare it to smaller liberal arts schools. There are many aspects of Haverford that could be used as a basis for comparison; size of student body, average SAT score, selectiveness, but using the Selective Liberal Arts Consortium (SLAC) gave a spread of different colleges that are considered to be in the same league. Looking at SLAC, Haverford is again one of the cheaper schools, and our graduates leave with the second lowest amount of debt. But averages never tell the whole story. Another way to look at the numbers is by comparing the actual tuition paid for each family income band at each college. When Haverford is put against SLAC and the Tri-Co it is still affordable? College Scorecard breaks out average assumed cost for students in a set of standardized income brackets. Although Haverford’s relative cost varies over different family income bands, Haverford is comparable in cost with its peer institutions. 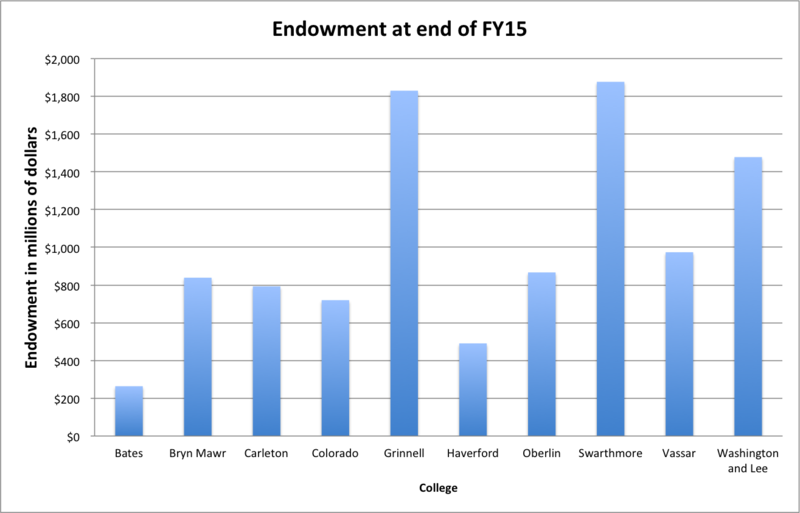 Haverford is actually not comparable in another, possibly more important statistic: the endowment. All data except Colorado College found on IPEDS. The University of Pennsylvania’s endowment is $9,582,335,000. Out of the eleven colleges in SLAC and the Quaker Consortium, four are need-blind: the University of Pennsylvania, Vassar, Grinnell, and Swarthmore. As can be seen in the graph above, those are the schools with some of the largest endowments. Vassar is the only one of those colleges with an endowment of less than $1 billion, but its endowment is still almost twice that of Haverford’s. The only college with a smaller endowment than Haverford is Bates, which is also need-aware. Haverford is following a wave of smaller, private colleges, losing their need-blind policy. Part of the issue is the endowment. Colleges that offer need-blind admissions are obligated to stand by those promises, and many colleges also promise some degree of affordability. As more people apply to college, the possibility of a class that has a high degree of need and mandates a bigger financial commitment from the school, grows. A need-blind admissions policy is a little like a blank check, and the college has to weigh the risk of that check being more than they can pay. 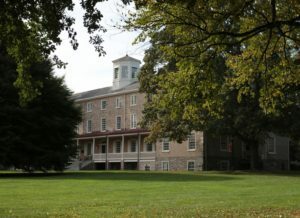 In a story about Haverford’s transition away from need-blind, philly.com reported that, Tufts, Colby, Wesleyan, Reed, and Clark all fall into the category of formerly need-blind schools. Even of the need-blind schools that the New York Times, reported on in 2012, many are not need-blind for Wait-listed, Transfer or International students. In general, larger schools connected with a state school systems like UCLA or University of Michigan, and the Ivies can afford a complete need-blind policy. The school had been an outlier, with one of the smallest endowments, trying to uphold a policy common only among the schools with larger disposable incomes. Haverford fought to keep its somewhat unusual (given size and resources) need-blind policy, but lost. It seems, given the school’s approach to need-awareness, that Haverford will continue to fight for what need-blind represents: keeping the doors of higher education open to everyone, not just those who can pay out of pocket. Can prospective students still afford Haverford? Hopefully. 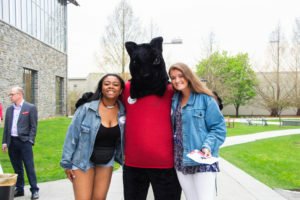 Haverford is still committed to meeting the full demonstrated need of all admitted students, as well as international students, transfer students and those admitted from the waiting list. The new need-aware policy will likely impact 5-10% of decisions. The class of 2020 was actually under budget, so while on paper the college may be need-aware, as of now, Haverford is still functionally need-blind.